Monica shares a big bowl of healthy comfort food. A fast weeknight meal or healthy lunch for one, but easy to scale up to feed a crowd. At the beginning of this year I decided to make 2015 my “fittest year yet”, benchmarked by a couple big “events”, including a cycle tour of France, a long distance walk and maybe even The Original Mountain Marathon if I can get my orienteering skills up to snuff. To achieve my aims, I’ve got a solid routine that includes swimming, spinning, CrossFit, lots of walking, lots of rest, and lots of sleep. I’ve also hired a nutritionist to help get my diet in check so that I can get the most out of my training. One of the things I quickly learned when I first started with the nutritionist is that I need to up my protein and, along with that, my omega-3s. The protein, perhaps, is a no-brainer, but what’s so special about omega-3 fatty acids? Quite a lot, it turns out. Omega-3 fats have a long list of documented health benefits: they improve cholesterol, help maintain normal blood pressure and improve brain functioning, just to name a few. For athletes, omega-3’s are especially handy because they help increase blood flow and decrease inflammation, two factors which help athletes train harder and recover faster. Omega-3 fats come in two varieties: long-chain and short-chain. Short-chain omega-3s are those found in plant-based sources like flax seeds and walnuts. The body needs to convert these to long-chain omega-3s in order to make them usable, a process that isn’t hugely efficient. Fortunately, long-chain omega-3s are readily available from fish! As such, I’ve been increasing my intake of fish to tick both the omega-3 and protein boxes of my nutrition goals. The heroes of the long-chain omega-3 fish world are oily fish like mackerel, sardines and salmon. But let’s not overlook the smaller players. 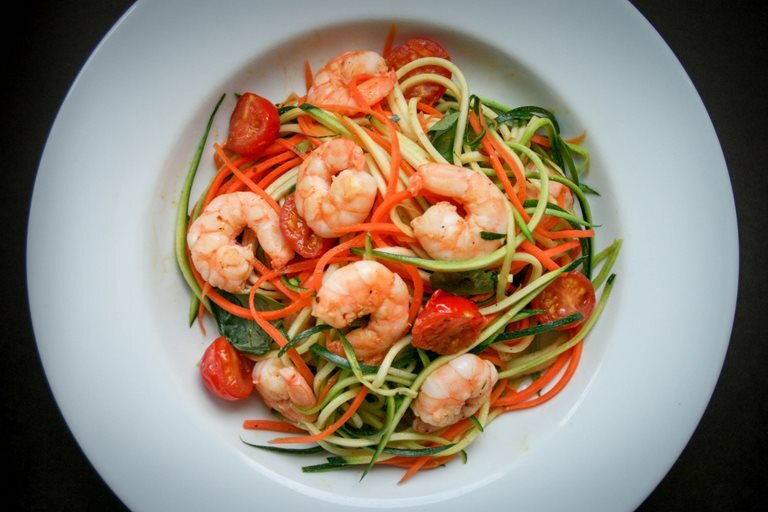 King prawns, for example, contain 140mg of long-chain omega-3s per 100g, not a bad dent in the 3 grams per week of long-chain omega-3 fats that the Scientific Advisory Committee on Nutrition recommends. 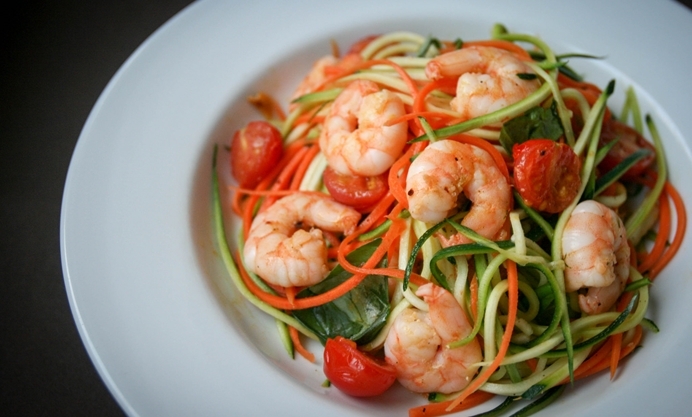 One of my favourite ways with king prawns is to sautee them with chilli and garlic then toss with carrot and courgette “noodles”. It’s a quick one-pan-meal that's healthy, low carb and choc full of protein and those awesome omega-3 fats. Oh, and it’s super tasty - you really can’t go wrong with garlic and chilli prawns, and the “pasta” turns into a big bowl of comfort food. This is an easy weeknight meal for one, but easy to scale up to feed a crowd. Season with salt and pepper and a squeeze of lemon juice. Serve!